The tongue load of any trailer is an important weight to measure because it affects the total gross vehicle weight (GVW) of your vehicle. This weight includes the curb weight of the vehicle, any cargo you may carry in it, and the people who will be riding in the vehicle. 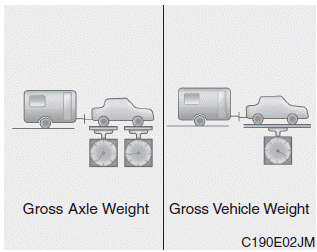 And if you will tow a trailer, you must add the tongue load to the GVW because your vehicle will also be carrying that weight. Never load a trailer with more weight in the rear than in the front. The front should be loaded with approximately 60% of the total trailer load; the rear should be loaded with approximately 40% of the total trailer load. Never exceed the maximum weight limits of the trailer or trailer towing equipment. Improper loading can result in damage to your vehicle and/or personal injury. Check weights and loading at a commercial scale or highway patrol office equipped with scales. An improperly loaded trailer can cause loss of vehicle control. With increasing altitude the engine performance decreases. From 1.000 m above sea level and for every 1.000 m thereafter 10% of vehicle/trailer weight (trailer weighter + gross vehicle weight) must be deducted.